No advance entries for this games, I was too busy. I told my wife Kristen last night that I probably wouldn't place in the 2/4 march but there was a chance in the slow march. The Campbell Games is not an easy venue. I based my prediction on a mock competition my instructor, Jay Salter, held Wednesday night. I played my 2/4 too fast and while all the embellishments were very clean in the slow march, I was off the beat due to holding certain notes too long. I have to say that this games really snuck up on me. I typically prepare much better. More time on the big pipes would have been beneficial as I installed a new chanter reed on June 6th, 11 days ago. For this games, Jay was available to encourage and support his three students, Paul Llewellyn, George MacKay and myself. Jay arrived at my house about 8:20, we hopped in my van and off we went for the 40 minute trip over the Santa Cruz Mountains to Campbell, in the Silicon Valley. We arrived to the challenge of finding parking. It was only about 9 o'clock in the morning and already it was packed, plus it was warm—it was going to be a scorcher! Paul was to play at 9:20, so the first order of business was tracking down Paul for Jay and helping him get ready for his first event. George MacKay was there with his wife and some relatives. There were also a number of other familiar faces around—Walt Innes, Sean Campbell, Colin Berta (judging), Casey Young (met him at Mt. Tam), Jan Richey (WUSPBA VP), Sue Altmeyer (WUSPBA Sanctioning Secretary), Bill McKown (of the Macintosh PB), Bob Brodie, Lloyd Christiansen, Gary Gifford, Amanda Gifford, among others. 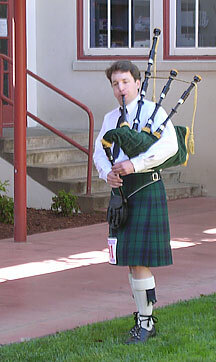 Gary introduced me to Bryan Reynolds, the subject in the 'piper with gun' photo at the Pleasanton Games last year. He thanked me for making him "famous" and said he got a good laugh out of it. My first event was the 2/4 March, scheduled for 10:32, I was last to play. Seumas Coyne was judging. 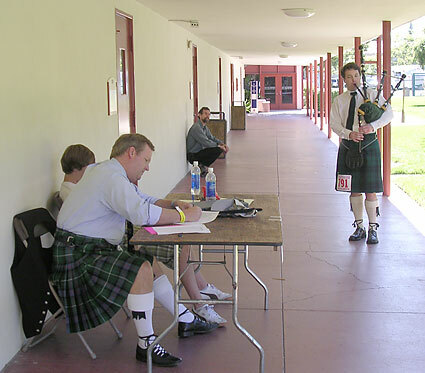 Here I am, facing away from the judge, playing a piobaireachd for a minute to warm up the pipes before competing in the 2/4 March. My pipes were sounding pretty good, though something was slightly amiss with the drones when I was warming up at the Platform 1. I really need to get in and clean my drone reeds, that and work on blowing the same pressure tuning as playing. Even harder to do in front of a judge in competion, but a very necessary skill to develop. I made an effort to try and keep the tempo of the 2/4 under control unlike Mt. Tam last month. While playing I felt I had somewhat successfully done that to an extent, but still it was a bit too fast. My embellishments suffered in spots. Slight choke in 4th part. Transition problems from top to bottom hand work. According to the schedule e-mailed out 4 days ago, I was to play the Slow March a little after 11 a.m. so I set down my pipes for a bit. Jay recorded my 2/4 march using my MiniDisc recorder (from the pre-MP3 digital recorder days), but the disc ran out, so he switched to his pocket digital recorder. He played it back for me and I was flabbergasted at how fast it sounded. I could have sworn I had played it slower. Boy, talk about time warping in front of a judge. I got up and saw that Walt Innes as playing his slow march. Hmmmm. "Walt is on right before me!" I checked with the steward, Bob Brodie, and he pointed out my time—it had been shifted up about a quarter of an hour! I told Jay and I steered us to the now vacant Platform 1. We were tuning up when Bob found us and told us I was on. Jay takes a listen to my pipes in preparation for my slow march. The building was separating us from Platform 2. In the background, Jan Richey is finishing up the paperwork as part of her 2/4 March steward duties. I walked around the building to Platform 2. Scott MacDonald was still writing up Walt's score sheet. I waited. Scott turned to Bob and asked if they were done. "There's still one more—Andrew Lenz." Now, Scott has judged me a number of times over the last few years and is no stranger. Smiling, he said, "I have to be careful what I write, it'll be up on the Internet!" I told him my tune, Braes of Lochiel, and he said I could play wherever I wanted. I opted to play on the breezeway out of the sun and off the grass. I struck in and played a bit of a piobaireachd. The drones sounded a touch off. So I was in a bit of quandary. I didn't want offend Jay by undoing his tuning, but also, did I really want to retune and run the risk of making it worse? My pipes have been a bit finicky the last few months and a bit trickier to tune precisely. I did adjust my outside tenor reed last night and this morning again to tune lower on the pin, it had been pretty high and probably had been a bit unstable as a result. Jay crouches against the wall listening intently, recorder running. I played my tune, felt I did pretty well maintaining a steady tempo. Stayed on the tune, felt it was musical, no chokes, though I thought something went slight awry the something once on the top hand, with hindsight now, it was a High-A gracenote to High-G that I missed slightly, that is, didn't quite cover correctly, so it slurred just a bit—I'm not sure how audible it was. Also one muddy birl. But I didn't dwell on those while playing—that's death to a performance. When I was done playing, Scott wanted to talk to me. He asked if I had missed a High-G gracenote. I paused and stuttered, "Uh . . . I'm not sure." Scott then said I'd played it the same both times, so he was more or less asking about the setting. I know I had slightly flubbed something involving High-G, and when put on the spot I agreed that I had missed them as I honestly couldn't answer "no"—I simply didn't know at that moment. And I didn't want to come across as not owning up to something that I might have actually done. He also mentioned he wasn't hearing the D gracenotes from Low-G to B. Of the really common G, E and D gracenotes, D has always been the one that's given me the most trouble in needing more lift. I knew I didn't drop them, but maybe they needed to be more audible. I always have a hard time relating to a discussion of notes in a tune without sheet music in front of me, or at least taking some time to figure out the context in the tune. Once I memorize a tune, I don't think think of it in terms of B, D, E, whatever. It's music—a series of sounds. I have to decode it back into named notes and it's difficult for me on the fly while trying to listen to a judge (or instructor) explain where to focus work on improving a tune. High A blown better 2nd Part. @ start. Maybe this is the cause for drones out? Here things get a little interesting. Now, hours later, I've gone completely through the setting I have for this tune, which is from Donald MacLeod's book. There are no G gracenotes from E to High-G—impossible anyway, he probably meant a G-doubling (or High-A gracing), but then again there are none of those in the tune either. The Low-G to B in the third bar (1st & 2nd parts) have no transition gracenotes. The Low-G to B in the seventh bar (1st & 2nd parts) have a G transition gracenote. There is one D gracenote from Low-G to B in the first bar of the first part, though those two (first/repeat) are definitely audible even in the MiniDisc recording. So based on the MacLeod setting, I didn't miss any G gracenotes nor any D gracenotes. Bummer. I believe I got marked down due to the judge being used to a different setting. But judging is a tough job and a lot of competitors don't understand that—I get hours and a recording to analyze, a judge gets one shot and a few minutes. Jay felt that a judge asking a competitor if he/she missed a gracenote is inappropriate. 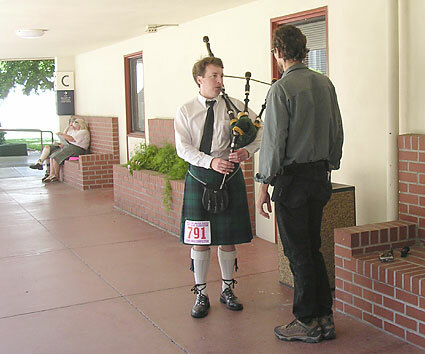 I remember hearing/reading stories of a legendary piper. . . I'm pretty sure it was Donald MacLeod, though it might have been John Burgess . . . who, when he made a mistake in a part, would carefully replicate that exact mistake in the repeat of the part—as long as he was consistent, if questioned, he could just claim it was the setting he was using, so the judges couldn't mark him down for it. Of course, the judges didn't ask as there wasn't any point. He won a lot. In my case, I'm not that good, it was the setting! I was hoping the new chanter reed would help with the overblowing, but it didn't quite solve that problem. Listening to the recording, I did discover, on the other hand, that my blowing didn't sound quite as steady as I'd like. George MacKay did very well and placed in both the 2/4 March and the Slow March. Paul Llewellyn was blanked as I was. Well, I have to say, I'm frustrated with my competition performances this year—it's very disheartening. "Good potential" on a judging sheet is . . . well, meant as encouragement, but for where I should be, it's saying "you have lots of room to grow—because you playing today was not so good!" But it is a reflection of my practice time, which has really suffered the last six months. Work has really worn me down. But we have a couple interviews coming up so, hopefully, we can get better staffed and take some pressure off. Otherwise, I'm going to be continuing in a state of semi-burnout—it's hard to practice when you are dog-tired. I don't know if I'll make it to the Monterey Games this year, we may be off in Washington State visiting relatives that week. It's yet to be determined. Next one might be Pleasanton, I'm already signed up for that one.